I took some time last week for a thorough spring cleaning of the studio. It’s amazing what odds and ends linger in strange places long after a project has ended, and it felt good to get everything back into it’s proper place and all the surfaces cleared off. We also moved in a new piece of furniture – an antique cedar chest that belonged to my wife’s grandmother – so we had to do some trial and error to figure out where it fit best. In the photo you can see it in the back left corner. Embroidery – I’ve been working on a line of machine embroidery designs that are currently in the testing phase, and which I hope to release for sale this spring. That means lots of stitching out, making samples, and taking pictures. As well, I have an 18th c. man’s waistcoat of white linen that I am embroidering with a floral design in shades of grey and white. Client projects – I am working on several big projects for a client. On the list are a WWI ambulance driver’s uniform and nurse’s uniform, a 1912 silk suit and all the underpinnings, and some early 1920’s lingerie. Costume College projects – I’m also thinking ahead to this year’s CoCo, especially since last year’s weight loss means my closet is empty! On my list are 1830’s underpinnings, a day gown to match a lovely red bonnet I have, and crazy hair to wear with the underpinnings for Sunday undies. I also plan to make a new 18th c. chemise gown and open robe, new stays, and a fabulous new hat. I have a partially-completed pink silk striped gown and raspberry pink petticoat that would be nice to finish for the gala. If time allows, I’d like to finish a 1950’s day dress and a Gatsby-inspired day dress to wear to classes (and summer picnics!) We’ll see how far I get on this project list, since they have to work themselves in around everything else. I’m really excited about this list, and as luck would have it, some projects tie in nicely with this year’s Your Wardrobe Unlock’d competition. I hope to have better luck blogging this year’s projects, since they aren’t secrets, rush jobs, or boring renovations of costumes I didn’t originally make. 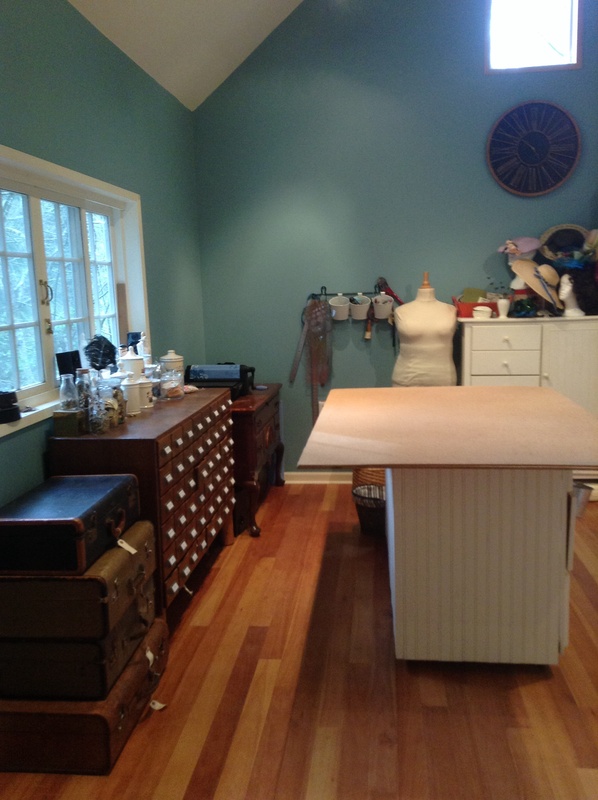 Beautiful workspace and blog! Congrats!